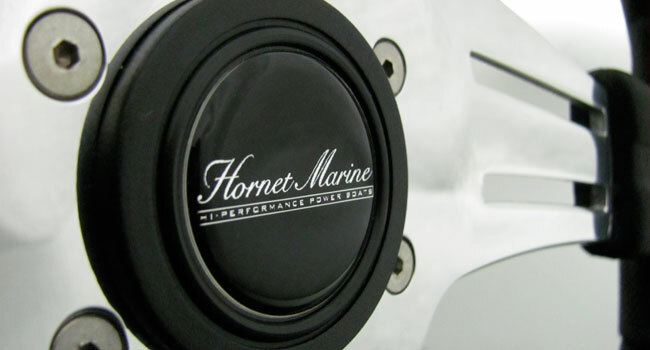 See your Hornet Marine dealer to learn more about custom motor packages. Three fully insulated bins are conveniently located underneath the Hornet 17’s L-shaped bench seating. With built-in drainage and full insulation, use any as a cooler to keep your beverages chilled all day long out on the water. Bringing extra gear? When not being used as a cooler, each bin conveniently transforms into a storage center. High-intensity LED navigation lights are best in class to ensure your safety at all times. All navigation lights are also US Coast Guard approved. The Hornet 17’s smooth ride is made possible by a proven deep-vee hull. With a 24-degree deadrise, this classic design has been sought after for decades and still inspires envy for providing the ultimate in comfort, control and stability. 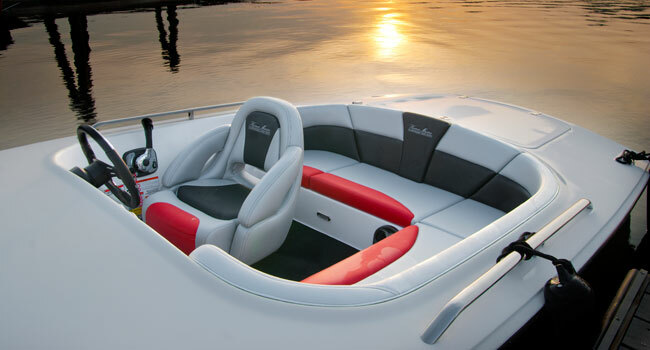 Chosen for its superior durability and high buff-back quality, the gel coat used to give each boat its glossy color is offered in unlimited options. Want to make a statement out on the water? We can also develop custom colors for a truly personalized look. All boats also include hand-laid fiberglass to ensure even consistency and quality. 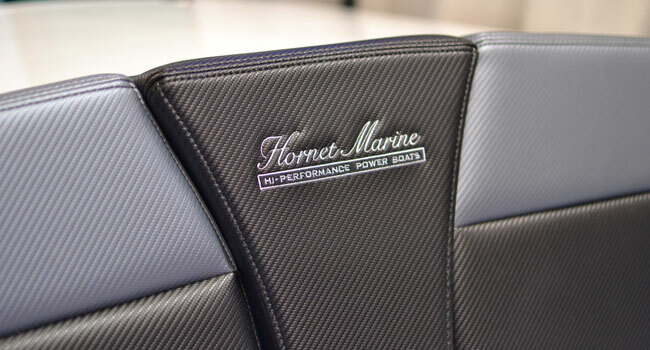 Your upholstery can be tailored to create a one-of-a-kind interior for your Hornet 17. With hundreds of color options and textures available, you can customize your upholstery right down to its stitching. 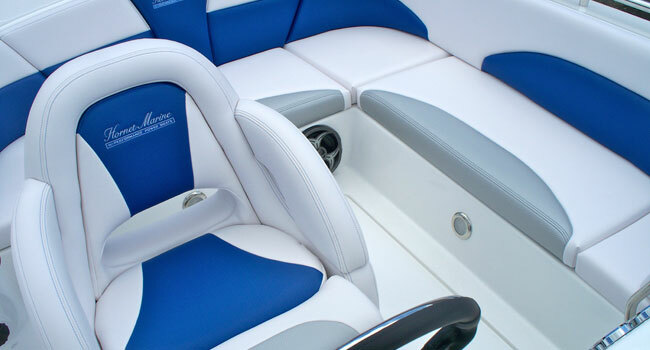 All upholstery is double topstitched and made of premium-grade vinyl for unmatched comfort and quality. We use only the best heavyweight marine fabrics to ensure your interior will be protected from stains, abrasions and UV fading. All that you have to do is sit back, and enjoy the ride. The Hornet 17’s clean lines and crisp styling are complimented by a sleek and modern dash. Sport steering provides a sharp response while ergonomically designed controls allow for easy operation. 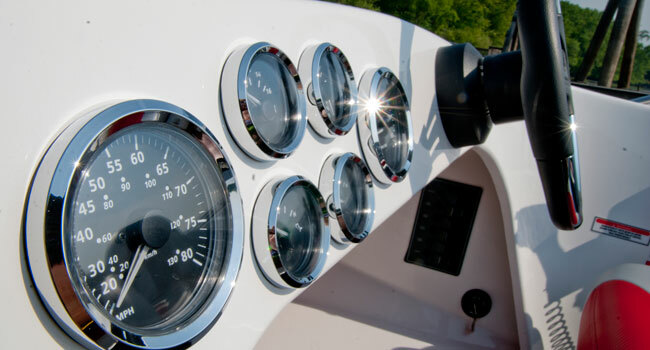 With multiple gauge and control packages to choose from, a boater’s rush of adrenaline starts here. 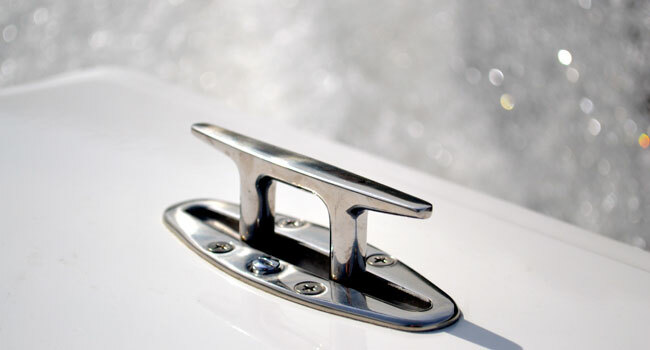 For unsurpassed style and quality, Hornet Marine uses mirror-finish stainless steel hardware. All deck hardware is flush mounted and features pop-up styling that is both user-friendly and distinctively modern. A thru hull exhaust system is the perfect choice for those who love the deep, throaty sound of a performance boat. Eye-catching stainless steel exhaust tips add a sporty look to ensure you travel in style. With the flick of a switch, Captain’s Call exhaust diverters allow you to switch from the louder thru-hull exhaust system to a quieter thru-prop mode. The Hornet 17’s transom is built to last and provide more fun out on the water. 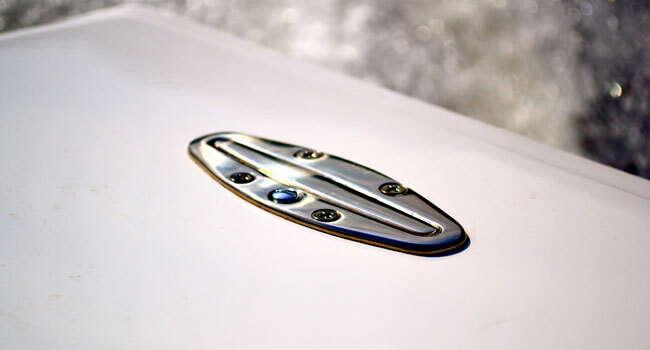 A flush-mounted ski tow matches the boat’s sleek styling while allowing for a variety of water sports. For when you’re hanging out in the water, a transom-mounted remote conveniently allows you to control the boat’s stereo system from outside the boat. A unique retractable ladder allows for easy access in and out of the water from the boat’s transom. The ladder features flush mounting and hideaway storage to keep it out of sight when not in use. The best in the industry, LencoTM electric trim tabs improve the overall performance of your Hornet 17. With instant response and self-resetting features, you will experience a smoother, faster, and safer ride. The LED dash-mounted controls also let you know tab positions at all times to provide a truly luxurious ride.